LAS VEGAS (June 30, 2014) — The Ultimate Fighting Championship® is proud to announce the Official Superfight Tournaments for Grapplers Quest®, the official grappling tournament at the UFC Fan Expo® on Saturday and Sunday, July 5-6 at Mandalay Bay Convention Center in Las Vegas. Amateur Competitors can Pre-Register, Save $21+ and get a limited edition competitor shirt until Wednesday, July 2nd at 11:59 PM http://bit.ly/UFCFanExpo2014 or register at the door with cash only (MAC machines on site). The two-day tournament will feature All Children and Teens No-Gi and BJJ Divisions and All adult No-Gi submission grappling divisions for Adults 18+ and the first rounds of the 16-Man and 16-Woman LIVE “Ultimate Grappler” Submission Only Tournaments hosted over two days, with qualifying rounds of the tournaments on Saturday, July 5. Then, on Sunday, July 6, the tournament will feature all-adult Brazilian Jiu-Jitsu Divisions as well as the LIVE “Ultimate Grappler” Finales of the Men’s and Women’s Submission Only Professional Divisions. Huge custom Octagon medals and Full Color Certificates will be awarded for All divisions are sponsored by EZ Flex Sports Mats (http://EZFlexMats.com), The Official Mat Sponsor of Grapplers Quest plus OTM Fightshops and Built To Fight Industries at http://OnTheMat.com – the official pro tournament sponsor and official Grapplers Quest rashguard manufacturing company. The Amateur UFC Fan Expo grappling tournament is limited to 1,500 competitor slots with nearly 1,100 slots already taken. Competitor pre-registrations end Wednesday, July 2nd at 11:59 PM PST – hurry and register today at: http://bit.ly/UFCFanExpo2014 and registrations will be available at the door. * Discount for Friends and Family to Join in YOUR GLORY! Grapplers Quest Superfight Tournaments start on Saturday, July 5th at 10:30 AM at UFC Fan Expo nicknamed “The Ultimate Grappler Tournaments” will feature Special Rules developed by Brian Cimins featuring two 10 Minute Submission Only Rounds followed by a Six-minute Overtime, if necessary, using Grapplers Quest points. The Finals will be Submission Only with No Time Limit and the UFC Fan Expo will host the LIVE Finals for The Ultimate Grappler Tournaments on Sunday, July 6 starting at 10:30 AM in the Center Rings. The UFC Fan Expo® in July will feature more than 300,000 gross square feet of activities for UFC fans, including meet and greets and autograph sessions with top UFC and STRIKEFORCE® fighters, Q&A sessions with top UFC personalities, as well as grappling tournaments and other special events. More than 100 exhibitors will also be on hand, giving fans the opportunity to purchase and experience some of the best sports and lifestyle products on the market today. This marks the third UFC Fan Expo® held in Las Vegas since its inception in 2009, with additional UFC Fan Expos being held in Boston, London, Toronto and Houston. For more information on UFC Fan Expo® and to purchase tickets, visit www.ufcfanexpo.com. 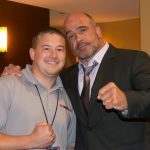 To subscribe to the official UFC Fan Expo® newsletter visit www.ufcfanexpo.com/newsletter. For companies interested in reserving space at this premier event, contact Brian Bernstein, Sales Executive at 203-840-5474 or email bbernstein@ufcfanexpo.com. Don’t wait, space is limited and will be sold on a first-come, first-served basis.